Zoya Akthar, the director behind the massive entertainer Zingadi Na Milegi Dobara, is all set and ready for the release of her next flick, the multi-starrer Dil Dhadakne Do (DDD), across cinemas on June 5, 2015. However, the journey to its long-awaited release started months ago. We’re not talking about production here. No, we’re talking about the movie’s promotion and marketing efforts, which have been simply outstanding. 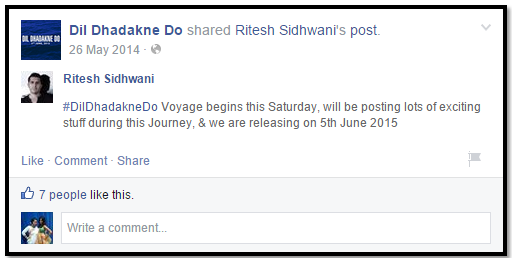 The promotional mood was set on May 26, 2014, when DDD film producer Ritesh Sidhwani updated a status that was shared by the official page of the movie on Facebook. This triggered the movie’s digital marketing campaign. It got the ball rolling in the right direction, as people began talking about it on Facebook. Soon, updates began to trickle in – but none of them had anything to do with the movie itself. Photos of starring celebrities – Priyanka Chopra, Anushka Sharma, Ranveer Singh, et al –began featuring on the movie’s Facebook page. They were teasers of an unusual kind, because they were fan-friendly. 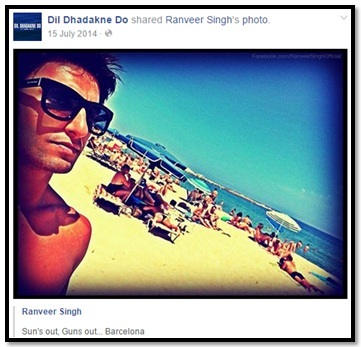 Pictures of locations where shooting took place, pictures of the cast and crew lounging on the beaches of Barcelona, and the like. This generated a lot of interest among fans. The page shared the starring cast’s photos from different channels, using cross-channel linking effectively. Videos were shared on Facebook, too, on which people shared their heightening interest to watch the movie. No movie’s social media campaign is ever complete without the proper use of a dedicated YouTube channel. 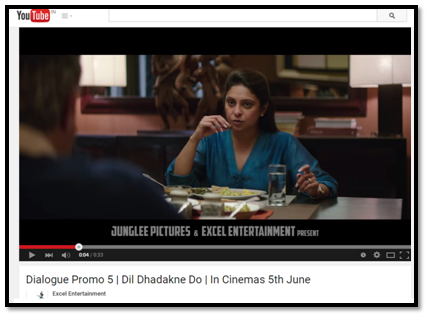 The DDD team released behind the scenes videos of the stars on the sets, teasers and trailers, and were prompt with the new tactic – dialogue promos. The music partner – T Series – was also quick in its scheduled and well-timed released of teaser videos of songs in the movies, which in turn were shared by the full cast and crew of DDD. The film too had its own Instagram account, where there were real-time updates galore, including everything from the cast having fun together during lunch breaks, to their meeting with Milkha Singh (set up Farhan Akthar). In a matter of 2 months, the account had posted more than 150 photos on the media tool. With celebrities being so open today on Twitter and Instagram, fans are pouring in just to get a glimpse of their life secrets. DDD’s marketing team tapped into Instagram’s full potential to rope in the interest of fans ever more. 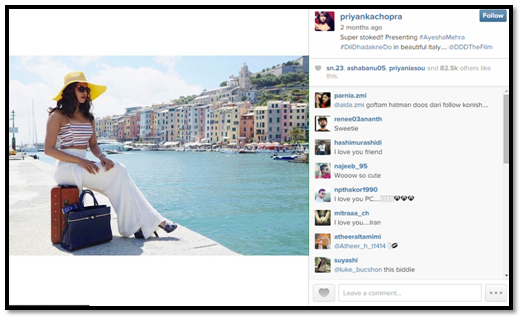 Priyanka Chopra, in particular, was tireless in her efforts to keep her Instagram account both personalised as well as promotional. Twitter was one of the smaller fractions of the movie’s social media marketing efforts. 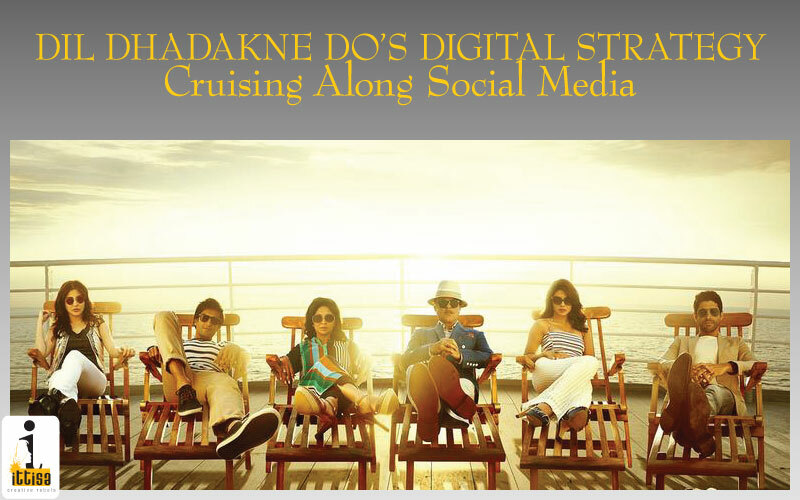 Relying primarily on cross-linking, Twitter helped the film in a small yet significant way as it did garner some popularity amongst loyal fans, who kept the hashtags trending. The film came up with hashtags that weren’t just about the film, but surrounding elements as well. There were contests run around hashtags such as #PhirBhiYehZindagi (a song from the movie), asking audiences questions. These were retweeted and favourited extensively. 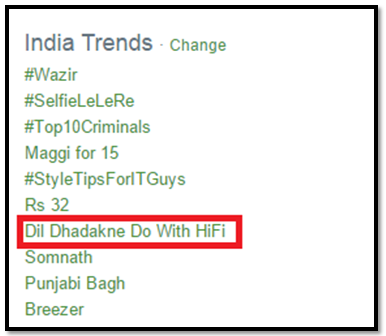 Other hashtags included, #2DaysForDDDTrailer, #DilDhadakneDoWithHiFi and #LeonardoSeDilDhadakneDo. This was where DDD really grabbed attention. Dubsmash, a craze among the collective youth of the nation (and incidentally, the TG of the film itself), was used by Ranveer Singh and Priyanka Chopra, both cast members of the blockbuster. It was no coincidence that the stars took to the media tool, though – it was pure, classic strategising: get fans to watch the video, indirectly remind them that their movie is forthcoming, thereby reinforcing a desire to watch it. Athough DDD didn’t have fancy apps like films like Krish and Ra-One, it did create contests that saw a lot of participation. @Pictures, which secured exclusive telecast rights to the film, invited viewers to share their fun and crazy family photos/videos via Whatsapp. This was part of the movie’s ‘Crazy Family Contest’. Shortlisted winners, @Pictures promised, would get to hang out with the cast of the movie. The efforts that have gone into the digital marketing process of DDD cannot be attributed to one person, team or channel alone. It cannot be more evident that everyone has pulled their support for this movie, and harnessed the power of social media perfectly. The movie did something unusual by shifting focus constantly from the movie to the stars to their ‘behind-the-scenes’ goofiness. DDD’s team also went the whole hog and used the latest ‘BAE’ meme to connect with younger audiences. The cherry on top, however, was use of Dubsmash to generate more buzz than ever, on social media.